This recipe makes four quarts of cordial. You can make a half batch, or simply scale it according to how many flowers you find. Don’t be afraid to get creative. If you don’t have a lime, use lemon peel, or try orange or grapefruit. 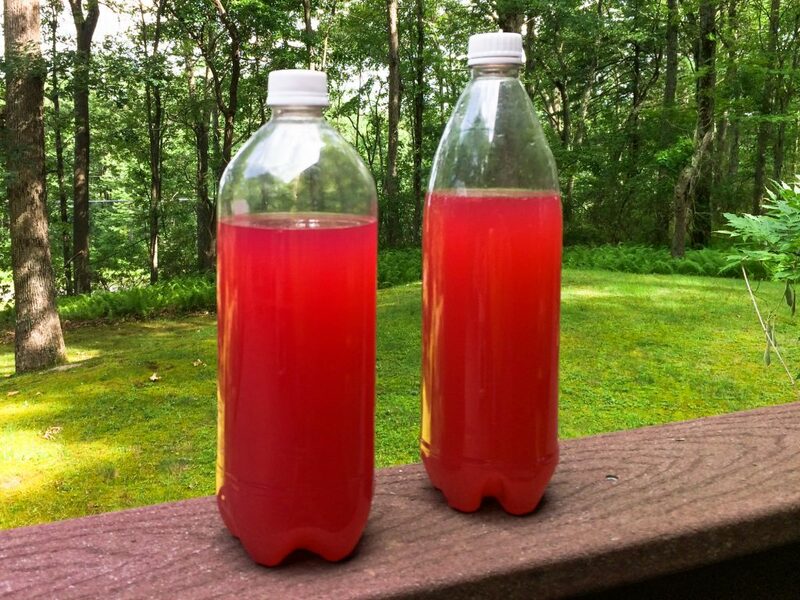 I use sterilized plastic soda bottles to store my finished cordial, but you can use quart jars or swing top glass bottles if that’s what you have on hand. The important thing is that you must be able to release the gas regularly, as fermentation continues. Snip the milkweed flowers off of the umbels and into a large pot or container. It’s ok to include the slim, individual flower stems, but you don’t want the thick stem of the umbel. Add the sugar, water, and lime peels, and stir to dissolve the sugar. Cover the container with a dish towel or cheesecloth and leave it on the kitchen counter at room temperature. Ideally, you’d give this a stir every day, to aerate the liquid and speed fermentation. But I had to leave town, so I fastened the cheesecloth to the top of the container with an elastic band, and hoped for the best. Five days later I came home to a wonderfully fermenting brew, so obviously the stirring isn’t 100% necessary. You’ll know your cordial is fermenting when a quick stir produces visible and audible bubbles. If you’re not sure, wait another day; you shouldn’t need more than 5 – 7 days. Strain off the solids, pressing on them to release all the liquid, then transfer the liquid into your bottles or jars. Leave a few inches of air space at the top of each bottle and screw on the tops firmly. If you’re using plastic, squeeze the bottles to feel how flexible they are; this will be helpful later. Leave the closed bottles or jars on the counter. As the cordial ferments it produces carbon dioxide, which builds up pressure in the bottles and forces the gas to dissolve into the liquid. The pressurized gas will be released as fizzy bubbles when the bottle is opened. One of the reasons I like to ferment in plastic is that you can feel how fermentation is progressing. Check the bottles every day, gently squeezing on their sides. When they are rock-hard (no give at all beneath your fingers) they’re ready to be drunk. You can either move them to the refrigerator for immediate consumption or keep them cool and dark until you’re ready. But milkweed cordial won’t keep forever, so don’t wait too long. Note: Pressure continues to build as the bottles sit. Left untended, they may explode, even in a cool, dark basement. Now’s your chance to learn from my experience: Once the bottles have reached the rock-hard state, leak a little gas from them at regular intervals. Loosen the cap for about three seconds, just enough to hear gas escape. Then tighten the cap and notice that you can once again feel a little give in the bottle. After a few days the bottle is rock hard again, and it’s time to repeat the process. Take this precaution and you’ll be explosion-free. Milkweed cordial is delicious all on its own, over ice. But I have bigger plans for this beverage. I’ll keep you posted….